A mural by graffiti artist Banksy has sold for more than £200,000 on eBay. But with so many imitations out there, how can you distinguish the real from the fake? Not everyone has a couple of hundred thousands pounds to spend on graffiti art, plus a few thousand more to remove the wall that it's scribbled on. So the latest buyer of Banksy's work, purchased in an online auction, would no doubt have checked that he's forking out for the real deal. With hundreds of street artists adopting the stencilled style of the most famous and secretive spray-can expert around, there are more and more imitations appearing. Many of Banksy's murals only last a few days before death by scrubbing brush, except in his native city. Bristol Council has made a pledge to preserve the work of its famous son, but it removes daubings thought to be fake. So how do you know if the mural at the end of your street is a genuine Banksy? What Sotheby's does when it has a painting attributed to Banksy is ring his dealer, Steve Lazarides, who owns a gallery in Soho. But that's no good to someone who stumbles across a Banksy-like scene under a railway bridge or on the side of a house and wants to know if it's real. Bill "Kilo" Pengelly, a legal graffiti artist who works on street-art projects with teenagers, is something of an expert. In the past year there has been an explosion in Banksy imitations, he says, some of which seek to fool the viewer by including the Banksy logo and recurring motifs such as a monkey. Exhibition in Los Angeles had real "elephant in the room"
Two key signifiers of a genuine Banksy work are a busy location and a political subject, he says. While other graffiti artists go for railway lines or rundown areas to reach their community, Banksy aims for the wider public. "He would do something in the middle of Oxford Street, but others get the areas where the walls either have permission or no-one bothers about them, in the middle of the worst housing estate or an abandoned warehouse." Banksy's work is bigger, bolder and more elaborate than others, says Kilo, but technically not very advanced. "If you look in a graffiti stencil book you will see work like this or better, but the difference with Banksy is where he's doing it and the topics." Areas like Old Street and Vauxhall are full of Banksy imitations, but the works lack detail, partly because Banksy uses multi-layered stencils while others use just one. Another option is to knock on the door of the nearest house and ask if Banksy has been by, says David Lee, editor of The Jack Daw, a newsletter of the visual arts. "Ask the owner of the property and ask if it's by him because he always asks permission. They are usually by him, it seems to me. If you have an eye for style then you'll see if it's one of his. There usually isn't very much colour, it's monochrome with spots of colour. Banksy's prints sell for thousands of pounds but he signs the authentic ones. And in the only interview he appears to have given, he said he did not care if people ripped off his work. The art world has long discovered that works officially classed as "authentic" may not be at all. The committee that verifies Andy Warhol's work has been accused of getting it wrong, rejecting works that are clearly real - although Warhol delegated some of the production, making it a complex question. Yet authenticity is the single most important thing you can say about a work of art, says the Daily Telegraph art critic Richard Dorment. "Until you know who made the work of art, it's very difficult to say anything else about it. If it's a copy, it has no meaning within that artist's group of works." Auction houses have teams of experts analysing the artworks for sale, but even they make mistakes. Last year Christie's was forced to withdraw a ceramic sculpture the day before auction because Grayson Perry told them that he had not made it. The techniques of artists such as Warhol and Banksy are more easily imitated than a painter like Renoir, says Mr Dorment, and mass production makes validation an increasingly difficult issue. "Andy Warhol churned out art, imitating the mechanical processes of industry, so the difference between the real and a reproduction and a copy is difficult to determine." Banksy uses stencils which saves time and gives his work sharp edges that are hard to replicate freehand. Stencilling used to be rare in the UK, more a technique seen on the streets of France, but Banksy's success means it's become very common. Acetate is a common choice of material but a cereal box will do the job too. Banksy has a greater degree of detail than most artists because his stencils are multi-layered. Critics say he is a competent rather than brilliant technician. His signature does not appear on all his works but on many of his pieces in the UK. In this piece, it's larger than normal. 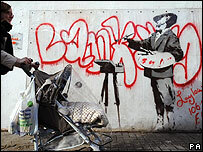 A fake Banksy in Bristol had his signature but some fans indicated it wasn't real because the paint ran. Most of Banksy's pieces are monochrome, with a splash of colour. This one is no different. The police officer is a Banksy motif - kissing another officer, questioning a child or generally being overzealous. Here there are three in riot gear trying to apprehend a teddy armed with a firebomb. Teddies appear in some of his work, notably as a witness to a child being frisked by a police officer. Banksy never explains his work but the implication in this work, as in many others, is that a figure perceived as weak and innocent is fighting back against the heavy hand of authority. It does what art is meant to do. Makes you look and think. Whatever your opinion, to have one means it has worked. Many earlier styles were regarded unsympathetically and then became highly regarded. I know many street artists, to them "Banksy" is a role model. Great! If they go on to create visual images that make people think then they are artists worthy of the name. Good fortune to "Banksy." May he go on for many more street scenes. A Banksy Rat in Belsize Park NW3 was recently painted over by some builders renovating some flats - pretty sure they would have made more profit selling the wall than spending 6 months laying wooden floors and painting the walls cream ! In one of Banksy's books, he discusses how the point of graffiti is that it's for everyone. These pieces that are originally drawn in public places, for all to see, free of charge. Once sold to someone it's not free anymore. This is a statement in itself. It shows how foolish Capitalism is at times; the desire to buy that which is free to everyone already. I disagree with the claim that this is mindless vandalism and should be removed. It is not an attempt to devalue or destroy property, but to add an artistic or political statement in the public arena. If van Gogh came back from the dead and daubed Sunflowers on a toilet wall, would we complain? The real success of Banksy is not his artistic merit or political statements, but as a marketing triumph. For "anonymous" graffiti to sell at auction, spawn a bestselling book and make it onto the BBC discussion forum is a level of success many brand consultants can only dream of. Art should be about if you like something or not and not about other people's opinions. I like some of Banksy's work but I also like other artists who use their work to make clever social points. He was not the first he is just probably the most well known / notorious and that is more to do with the Robin Hood identity he has created for himself. It's all vandalism anyway. So why the concern about "real" or "fake". Just remove it. How much longer are the people going to be duped into thinking this criminal's overrated vandalism is art ? 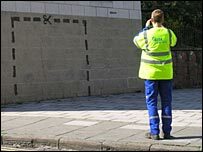 The photograph accompanying your article showing a council worker taking a photograph of a stencil deemed to be a fake is actually around the corner from where I live. It had been up for years before someone added the 'banksy' logo. Unlike most Banksy's where the logo tends to be in an unobtrusive spot this was placed at eye level next to the stencil. Suddenly lots of people were stopping to take photographs; at which point it attracted enough attention that it was removed shortly afterwards. So the fact that it's by Banksy is important, not how aesthetically "good" it is? What a triumph of marketing over substance; so much for being champion of the underground art culture.